With the title now firmly in their back pocket, Kettering Town can relax a little as they host Barwell and manager Marcus Law will use the opportunity to give a run out to some of the players who have been short of playing time this season. Kettering still have a duty to put out strong teams and play their best in their remaining few fixtures as they can still affect the play-off places for the teams trying to gain promotion with them. A fairly quiet first-half punctuated with a several good chances to open the scoring that were spurned. Most notably for Poppies was when Brett Solkhon looked to have scored but his shot came off the legs of the keeper and was deflected behind for a corner. Both sides keep plugging away and it could be a single goal that wins this encounter at Latimer Park. The second-half gets underway at Latimer Park, another early chance for Solkhon to score but this time he’s adjudged to be offside by a very small margin. A free header for Jamie Towers but he fails to trouble White in the Poppies goal. Another opportunity for the visitors from the corner but it’s another decent chance spurned. White out to collect and completely misses the ball but it goes wide. Lucky escape for Poppies. Kettering make a change as Lindon Meikle replaces James Brighton. It’s all Barwell at the moment as another effort goes wide of White’s goal and then White makes a save and Towers puts behind for a corner to Barwell which is easily cleared. Strange decision by the referee almost leads to a Barwell goal but Kettering somehow survive again without going behind. They really need to wake up and get back into this game. Hollis is replaced by Durkin for Barwell and youngster Joe Massaro replaces Ben Bradsahw. A half-chance for Poppies but Solkhon put the ball over the crossbar. It was coming, again Kettering fail to clear and Barwell have scored. It could be the damper on the title celebrations but Tower’s slip allows Hickey in and he puts it low into the corner. White makes a good save from Hickey as the minutes tick away. White stationary as the ball cannon’s back off the Poppies crossbar. It’s been a poor showing from Kettering this afternoon and Barwell are deservedly in front. Into time added on of three minutes and still the visitors are pressing for more goals. There goes the final whistle, ending a disappointing result for Kettering, but they will still be celebrating. The championship trophy is presented to Kettering Town and the players and fans celebrate the successful season. Kettering travel to AFC R & D on bank holiday Monday and then their final game of the regular season is at home to play-off hopefuls Stratford Town. Kettering Town: White, Brighton, Toseland, Solkhon, Stohrer, Richens, Milnes, Towers, Graham. Bradshaw, Rowe-Turner. Subs: Meikle, Kelly, Kelly-Evans, Stanley, Massaro. 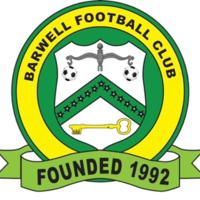 Barwell: Castle, Rowe, Putnam, Eze, Percival, Julian, Brown-Hill, Tomkinson, Towers, Hickey, Hollis. Subs: Durkin, Preston, Charley, Nisevic, Davidson-Miller. Poppies sign Shots striker Holman. » Kettering Town added more firepower to their already impressive attacking force in the shape of Northampton-born striker Dan Holman ..
Poppies win club of the month award, second this season » "Kettering Town, Tiverton Town, Peterborough Sports and Blackfield & Langley are the EVO-STIK League South September performance kings! ... "
Kettering Town Football Club have taken a giant step towards a return to the town .. The winding-up petition brought against League Two side Northampton Town has been withdrawn following a court hearing on Monday. The winding-up petition brought by HM Revenue & Customs against League Two club Northampton Town has been adjourned until 30 November. The Cobblers had been taken to court over £166,000 of unpaid taxes. Players and staff were not paid in October. The club also owe Northampton Borough Council £10.25m, which they were loaned to redevelop their Sixfields home.